This entry was posted in The Rubaiyat, Uncategorized and tagged drinking references in the Rubaiyat, omar khayyam. Bookmark the permalink. 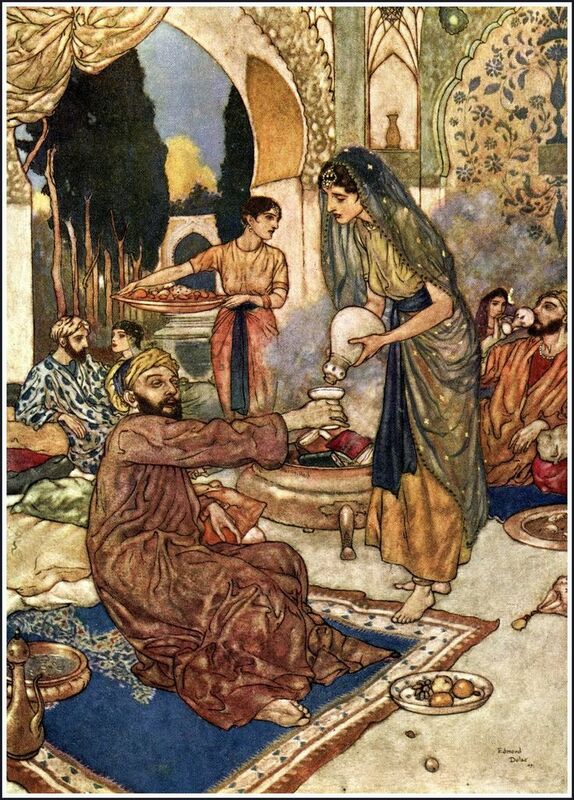 Omar Khayyam was a Muslim. Drinking was forbidden. To my understanding, Khayyam wrote at a time and place where Islam was the governing religion. It would seem to me that, had he actually drunk wine, he’d have run afoul of the authorities and been punished. Understanding the essence of Khayyam’s poet is a little challenging for a reader not familiar with Persian poetry. But his poems are actually not merely about wine. He is actually expressing a profound sadness and even anger towards the cruelty of the cycle of life and death. And wine is a way to escape or -at least – temporarily forget the pressing fact that we all are to die despite all the achievements we have had in our lives! Khayyam repeatedly reminds us of death and that we are insignificant creatures in the eyes of the creator. It is obvious to the great mathematician that the precise machine of universe does not care about us! He even calls humans “poppets” of the universe in one of his poems. Khayyam is baffled with this crazy game that the creator has designed for us. He does not understand why we should be such marvelous sensitive and smart beings and still die! Death is an insult to Khayyam intellect. In one of his poets, he says “I wonder who would make the most magnificent work of art (the human race) and then right after he develops it to perfection, shatters it to the pieces? !” Seriously, why!? The fact that we are all going to die is so overwhelmingly cruel that one has no choice other than escaping from it. Most people are fortunate enough to not be as smart as Khayyam. Ordinary people do not see the whole picture and therefore they are safe from the cruelty of life. But for a wise man like Khayyam, perhaps wine is the only escape. Note: in Muslim belief, drinking wine is a sin and can prevent you from going to the Heaven.